The 94th would arrive in the European Theater of Operations (ETO) on 11 August 1944 under the command of Major General Harry J. Malony. They would set foot on the European continent on 5 September, D-Day plus 91 (D+91) and in relief of the 6th Armored engaged the German garrisons located in the ports of Saint Nazaire and Lorient on the Brittany penninsula. In January of 1945 the 94th moved east to relieve the 90th Division in the Saar-Moselle Triange. From an initial position opposite the Siegfried Switch Line they began offensive operations on the 14th of January and took the towns of Tettingen and Butzdorf followed by Nenning-Berg-Wies before being blocked at Orscholz. February would bring victories at Campholz Woods, Sinz and Munzingen Ridge. By the end of the month the division working with the 10th Armored Division had secured the area from Orscholz-Saarburg to the junction of the Saar and Moselle Rivers. By March the division crossed the Saar via a bridgehead at Serrig and established allied lines through Zerf, Lampaden, and Ollmuth and were moving toward the Rhine. They reached the Rhine on the 21st and began a battle for Ludwigshafen. April had the 94th located on the west side of the Ruhr pocket and by the middle of the month were operating the local military government in Krefeld. They were located in Dusseldorf when the V-E Day arrived. 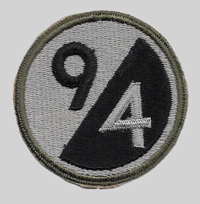 The 94th Infantry Division had been activated on 15 September 1942 at Fort Custer near Kalamazoo, Michigan. The core composition of the Division was comprised of the 301st, 302nd and 376th Infantry Regiments. Major General Malony was their only commanding officer during their war time service stepping down following the German surrender. The division returned to the US in 1946. 11 Aug 44	Lt. Col. William H. Patterson, Jr. There are 13 soldiers of the 94th Infantry Division World War II still listed as missing in action.